Supple and stable for securing loads in several key settings, our 24mm 6×24 galvanised wire rope should suit a range of businesses and operators. It can be included as part of an assembly or produced in plain lengths to be used as you see fit. With a fibre core at its centre, this wire rope is a little unusual in terms of the flexibility it offers. 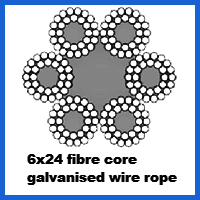 Each bundle has 24 steel wires wrapped around a separate fibre core, which allows for even more malleability. The SWL for this rope is set at 32,223kg at the upper end, while it is also rated to offer a breaking force of 316kN. This makes it somewhat sturdy, even if it can be crushed and snapped more easily than wire core galvanised ropes. Being resistant to corrosion, this rope works well outdoors or in marine settings where moisture is unavoidable. For more rust-free ropes, consider our stainless steel products. You can get even more out of your Rope Services Direct order if you ask for fittings to be included with your 24mm diameter 6×24 construction rope. We have the engineering knowhow to set everything up to be safe and secure, which means you do not need to tinker with the rope yourself once you take delivery. See what we can do for you at RSD by calling 01384 78004 or emailing us to request a quote, ask a question or seek guidance on wire rope issues. 24mm 6x24 Galvanised Wire Rope Overall rating: 5 out of 5 based on 6 reviews.